An update from the band on what they've been up to and what they have to come in the new year. 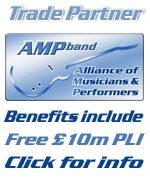 SHOWCASE YOUR BAND AT THE TALBOT BURNLEY..
Have a good xmas to everyone on NWB! - Enjoy the Gift! - Click to Unwrap! Merchants of cool would like to wish everyone a Happy Christmas and a Rockin' New Year! How do bands confirm sightings? I've had a couple of people who said they've seen us play live, clicked the 'seen them!' button, but how do i confirm they have? merchants of cool live at the Red Lion-Goostrey this saturday! Fantastic Free/Bad co covers band-support live music! Some pepole said it would never happen? THE ODDFELLOWS ARMS RE UNCLE ROTTER. is there any practice places around the blackburn and darwen areas? Thanks to Banjo and the Thatched House for a great nite-Remember we are the Merchants of Cool! We really enjoyed ourselves and look forward to coming back in 2009! Hallowed @ The Station, Altrincham tonight!! Snakeskin in the recording studio.